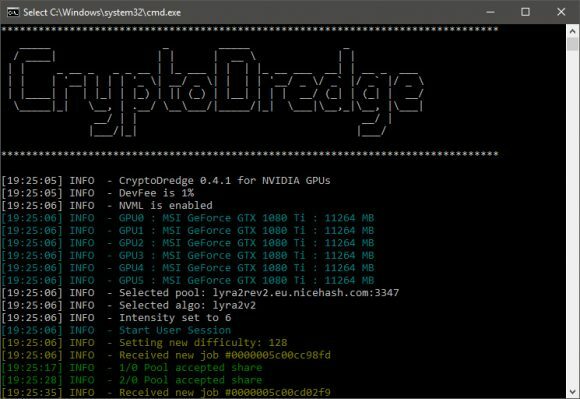 CryptoDredge is a new Nvidia GPU miner that we have recently talked about as it is offering one of the best Lyra2REv2 performance at the moment. It is a closed source miner that support the following algorithms: Allium, Lyra2REv2, Lyra2z, NeoScrypt and PHI1612 and requires Nvidia GPUs with Compute Capability 5.0 or newer (Maxwell or Pascal architecture). There is a 1% developer fee built-in, so make sure you are Ok with these before checking it out if you still haven’t and make sure to update if you are using the miner already, as it is quite interesting for people mining crypto coins using Lyra2REv2 and Lyra2z algorithms. 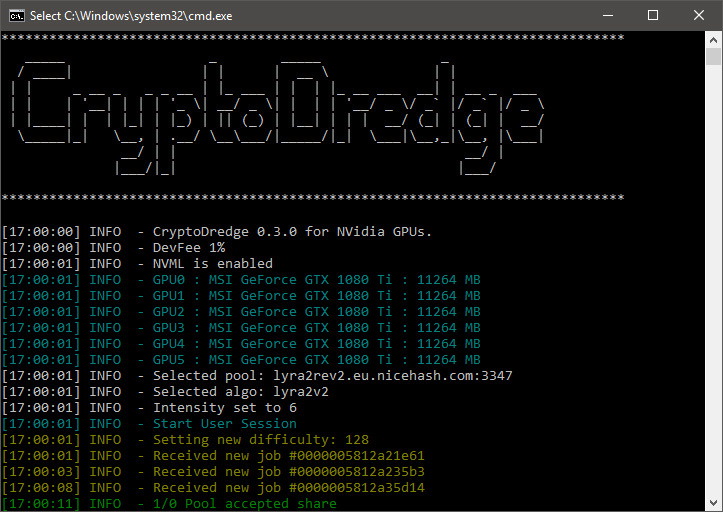 The latest version CryptoDredge 0.4.1 adds a bit more performance improvement for Lyra2REv2, we are seeing about 5% increase on GTX 1080 Ti compared to the previous version of the miner, though note that the improvement may vary from one to another GPU. Another interesting improvement is that Lyra2Z should now be mineable on all of the supported Nvidia GPUs and not only on GTX 1050 GPUs. The third interesting new feature is that the miner should now be able to check for new versions and report the availability of such, no auto updating though and we still need to check the feature out when a new version comes out. 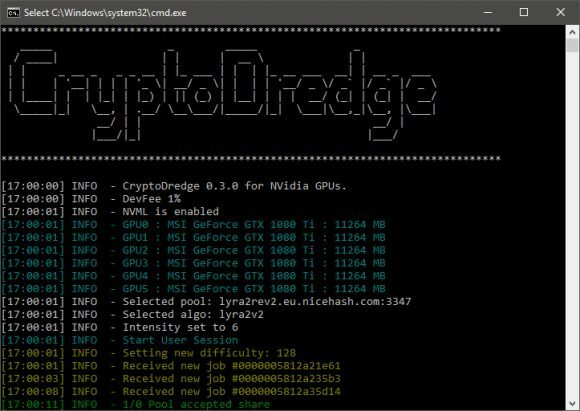 CryptoDredge is a new simple and highly optimized crypto currency miner software for Nvidia GPU mining rigs that supports just a few algorithms at the moment, but performance wise it looks very promising. It support the following algorithms: Allium, Lyra2REv2, Lyra2z, NeoScrypt and PHI1612 and requires Nvidia GPUs with Compute Capability 5.0 or newer (Maxwell or Pascal architecture). Currently Lyra2z support is only limited to GTX 1050 GPUs, all other algoritms should work fine on other Nvidia GPUs. Also have in mind that CryptoDredge is a closed source miner available only for windows at the moment and it comes with a built-in developer fee of 1%. What caught our interest initially with this new miner is the claim that it is the fastest Lyra2REv2 miner, so we had to compare its performance with the most popular Lyra2REv2 ccminer from from Nanashi that most people still use when it comes to mining Lyra2REv2 on Nvidia GPUs. 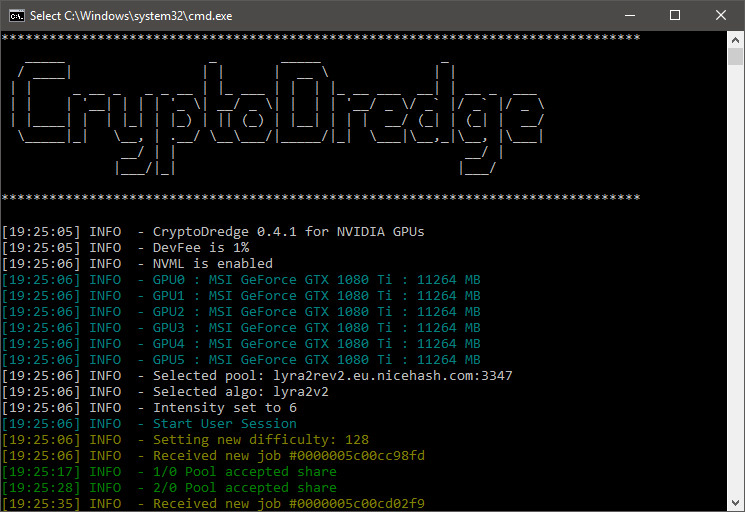 Well, we can confirm that we are getting around 15% better performance with CryptoDredge vs the same settings using the ccMiner 2.2-mod-r2 fork by Nanashi Meiyo-Meijin on GTX 1080 Ti. So if you are mining a coin using the Lyra2REv2 algorithm or are selling your Lyra2REv2 hashrate on NiceHash you might want to check out the CryptoDredge miner.